Why Isn't There More Ferry Service in the Bay Area? As part of our Bay Curious series, we are answering questions from KQED listeners and readers. ho doesn't love a ferry ride? "It's a wonderful way to go," says KQED listener Danielle Svetcov, a literary agent who lives in Corte Madera and takes the ferry from Larkspur to San Francisco. "Everybody on the ferry is in a little bit of a Zen state." "What happened? And when can we get back to a period when ferries were the dominant mode of transportation?" What do you wonder about the Bay Area, its culture or people that you want KQED to investigate? Ask Bay Curious. Ferries were the main way people crossed the bay before November 1936. They were part of an extensive system of passenger and automobile ferries that went to places not accessible by marine craft today, like Stockton, Fremont and San Leandro. "There were easily triple the routes we have today," says Kevin Connolly, the planning and development manager for the Water Emergency Transportation Authority. More than 50,000 people ferried across the Bay daily. After the Bay Bridge opened in 1936, ferry ridership plummeted. It became more convenient to drive, or take the train, known then as the Key System, which also crossed the Bay Bridge. There was a rebirth of ferries in the 1970s, during the oil crisis, and again in the early 1990s after the 1989 Loma Prieta earthquake. But after that, ferries sort of stumbled along. Fast forward to 2016, when the ferry is once again popular. Both the Golden Gate and San Francisco Bay ferry systems carry more than 16,000 passengers each weekday. The Bay Bridge, meantime, now has some of the worst congestion of any road in the Bay Area, and BART trains are packed, which helps explain why, when it comes to ferry travel, "we are in a position now where we can't meet our demand," says Connolly. 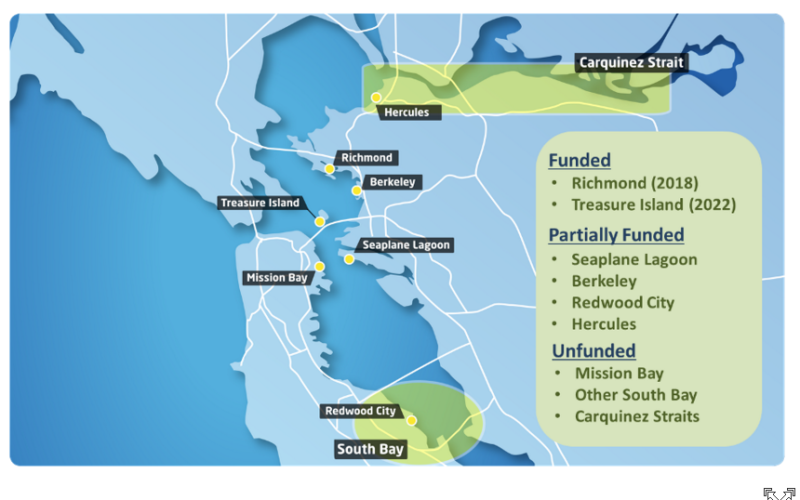 There are more ferry terminals coming, including one in Richmond, which opens in 2018, along with Treasure Island in 2022, and Berkeley, which the WETA would like to see in the next 10 years. Why, if there are Apple buses and Google buses, aren't we moving through water instead, and why isn't private business helping make that possible? Two private companies are helping to fill some of the demand. Prop SF has contracted with what its owner describes as "some of the biggest companies" in the Bay Area to shuttle workers to Redwood City, and other locations where public ferries currently don't go. "We want to get people out of their cars, and back on the water where it's largely underutilized," says James Jaber, the head of Prop SF. The company currently has one 36-seat catamaran, and is planning to purchase more vessels. Jaber says his nimble vessels might some day be able to get into places where larger public ferries would never be able to go, because the water is too shallow -- like San Jose. 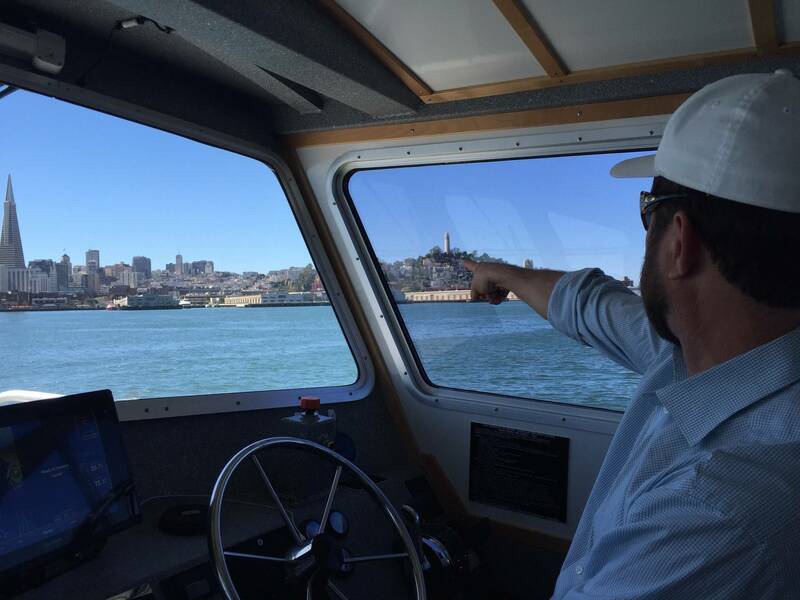 Another company, Tideline Marine Taxi, recently helped fill the void when Blue & Gold, a private ferry that offers service to the general public, temporarily suspended service between Tiburon and San Francisco for maintenance purposes. Both companies would like to eventually offer public ferry service, and their applications are currently pending before the California Public Utilities Commission. The main hurdle to building more ferry terminals and expanding ferry service in the Bay Area is the cost. And there are also environmental concerns. It would be impractical, Connolly says, to turn the clock back 100 years, and start dredging parts of the bay -- some of which are now wetlands and trails -- where old terminals used to be. 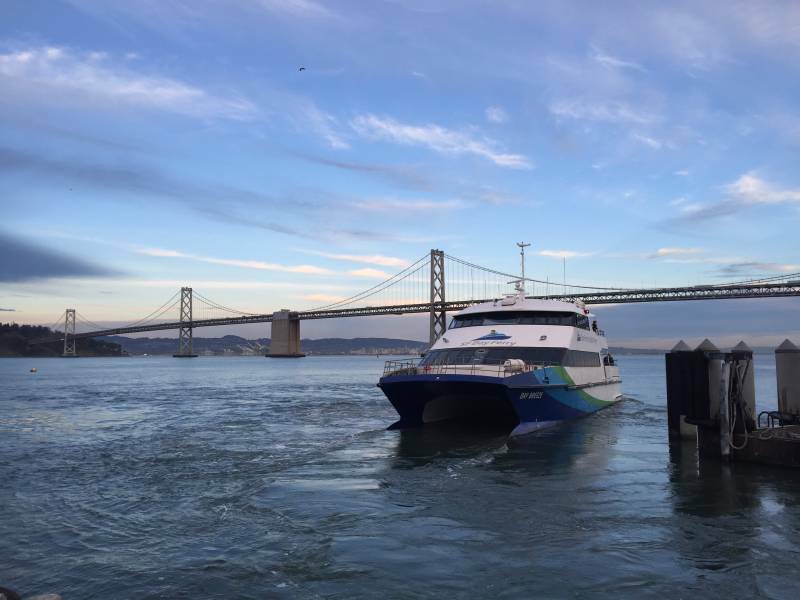 Planners at the Water Emergency Transportation Authority created a draft strategic plan that outlines a 20-year vision for ferry service in the Bay Area. Eventually, the agency would like to increase the number of vessels it operates from 12 to 30. Some have criticized the plan for not being aggressive enough. "I think the draft strategic plan is reflective of underlying funding limitations," says Jim Wunderman, president of the Bay Area Council, who sits on the agency's board. Wunderman says he would like the agency to come up with a "more visionary" plan, and "not worry about where the service is coming from, but what kind of service would really benefit the public and the Bay Area." WETA officials are currently revising their strategy. Public ferry service is funded through Bay Bridge tolls and fares -- and those fares aren't exactly cheap. But Connolly says the agency is working to make the system more affordable. Looking ahead, Connolly says the idea for future ferry service is that eventually you'll be able to catch a ferry every 15 minutes without having to consult a schedule. It's hard to say when that day might be. But how does all of this sit with our question-asker, Danielle Svetcov? "It does seem like there needs to be more urgency, but I do understand that civic projects take time," she says. In the meantime, she plans to keep riding the ferry, no matter how crowded it gets. "I dream that it will go in every single direction on the bay one day," she says. Got a question you want the Bay Curious team to investigate? Ask!